Superman Slots, its Symbols: Lex Luthor; World Bonus Game - SlotsSymbols.com - Save the world with the Superman Slots! Save the world with the Superman Slots! Haven't you imagined sometime that you are the one who always saves the world from some catastrophe or evil invaders, and frightened people always need you, every time when their lives are threatened? If no, it means that you are a woman! And you want to be that one who will be saved by the hands of the Superman! He is an omnipotent creature that is always in readiness to help you. In our case he comes to help you to conquer the game of superman slots. The various symbols that you are going to meet while playing are really amusing; the graphic itself is worth your thrown coins, which depending on the chance can bring you to sweep the board in this slot type. Or maybe not chance, but random number generator, but who wants to be obsessed about this? There are 5 reels and 50 pay lines. Great chances! Put additional 10 coins and you can have the bonus bet features to the played 50 pay lines! The main symbols are: S Logo, Lois Lane,LexLuthor, Kryptonite, Tank, the Daily Planet, glasses of Clark Kent, different Explosives and of course Superman! The wild symbol that can give lots of opportunities is the Superman himself. Try to catch him! But remember that this symbol can't replace the Scatter Logo. You will have the multiplied payout if you manage to get the wild in the winning combination. Do you want to have a free game function? Just find the Superman on the 2nd, 3rd, and 4th reels and then, my congratulations, the chance to have 10 games at your expense is here! 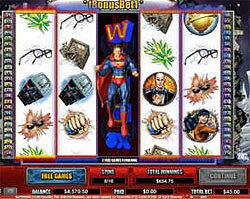 The Superman symbol is not the simple wild as in the other slot games. I have already said that he is omniscient and even can make the total reels be wild, extending in such way his forces. Hue it! 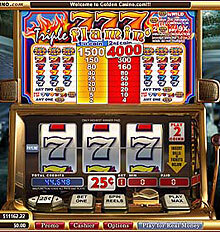 You have the opportunity to get the multiplier which tends to be random and hidden within the 2 to 5 reels. Does the Superman need a mate? Exactly! And namely you will be the one who will be helping him to take away that huge bag of cash! He will be prompting how to act, where to find and also the superman will definitely share his money with you! Or just bonus game, it's also cool! Spin up the 3 symbols of superman scatter. Clear the path in the meteor field, while pursuing the LexLuthor symbol and then you will have the Save the World bonus game! The missiles are destroyed and the staked bet will be doubled into 100 times. Isn't it attractive? The superman must make his way to Earth very carefully then he has to make a deciding choice which one of 3 doors to choose. The outcomes differ: wether he will encounter the kryptonite, whether the hostages or LexLuthor who will be the exactly one that will help to grab the bonus prize. It is really funny to control the actions of the Superman himself! The impressions are worth playing this gambling game!